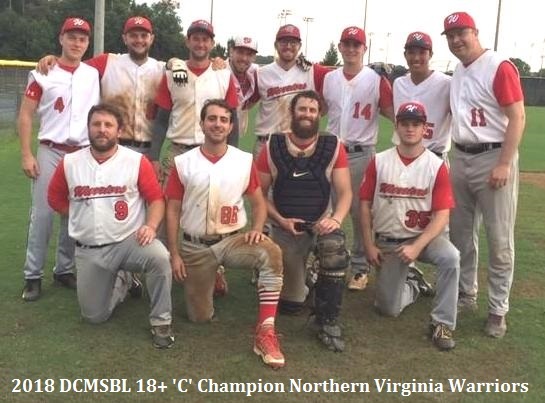 The Northern Virginia Warriors have won four DCMSBL championships in the last eight years, with a few runner up performances mixed in as well. We suffered a heart breaking loss in the last inning in the third game of the 2017 championship and made it our mission to come back even stronger in 2018 and win it all. This was no small feat given 80% of our team was brand new to the squad in 2017. It took half the season in 2018 to build up the team chemistry and find our Warrior drum beat, but once it was found we didn’t look back. Win or lose we have a group of warriors that give it all on the diamond and enjoy a few cold PBR’s postgame!